A lecture by Dr René Rodríguez-Gutiérrez, from Mayo Clinic, USA, delivered at McMaster International Review Course in Internal Medicine in Kraków in May 2017. A lecture by Dr Mark Loeb, from McMaster University, Canada, delivered at McMaster International Review Course in Internal Medicine in Kraków in May 2017. 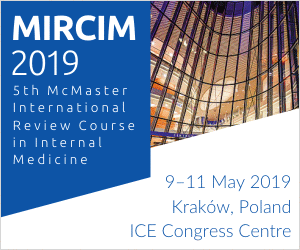 A lecture by Dr Victor M. Montori, from Mayo Clinic, USA, delivered at McMaster International Review Course in Internal Medicine in Kraków in May 2017. A lecture by Dr Julian Dobranowski, from McMaster University, Canada, delivered at McMaster International Review Course in Internal Medicine in Kraków in May 2017. A lecture by Dr Paul O’Byrne, from McMaster University, Canada, delivered at McMaster International Review Course in Internal Medicine in Kraków in May 2017. A lecture by Dr Imran Satia, from University of Manchester, UK, delivered at McMaster International Review Course in Internal Medicine in Kraków in May 2017. A lecture by Dr Christine Lee, from McMaster University, Canada, delivered at McMaster International Review Course in Internal Medicine in Kraków in May 2017. A lecture by Dr Paul Moayyedi, from McMaster University, Canada, delivered at McMaster International Review Course in Internal Medicine in Kraków in May 2017. A lecture by Dr Pere Ginès, from University of Barcelona, Spain, delivered at McMaster International Review Course in Internal Medicine in Kraków in May 2017.